Well she's not on O2, is she? The party is finally over: as of today, Virgin Media's London Underground Wi-Fi is no longer free for all. Londoners will now have to open a web browser on their devices and log-in to use the platform-based network, logging in as a Virgin Media, EE, T-Mobile, Orange or Vodafone customer, or opting to pay for access if they're not on any of the above. Those who have TV, broadband or phone with Virgin Media will still be able to use the subterranean Wi-Fi without paying any extra. As will people rocking EE, T-Mobile, Orange or Vodafone contracts after a deal was struck between the companies back in November. For those not affiliated with any of the aforementioned companies, prices start at £2 for a day's Wi-Fi access, while a weekly pass will set you back £5 and a monthly one £15. 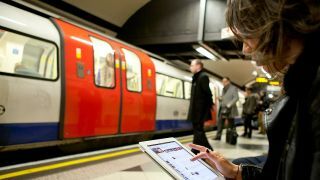 Virgin Media's Wi-Fi network now lets customers get online at over 80 London Underground stations, and was originally intended to be free just for the Olympic summer. The company extended the free Wi-Fi until January 2013, making it all the harder for commuting Londoners to cope with the Wi-Fi withdrawal.